Point Reyes National Seashore has so much to offer. 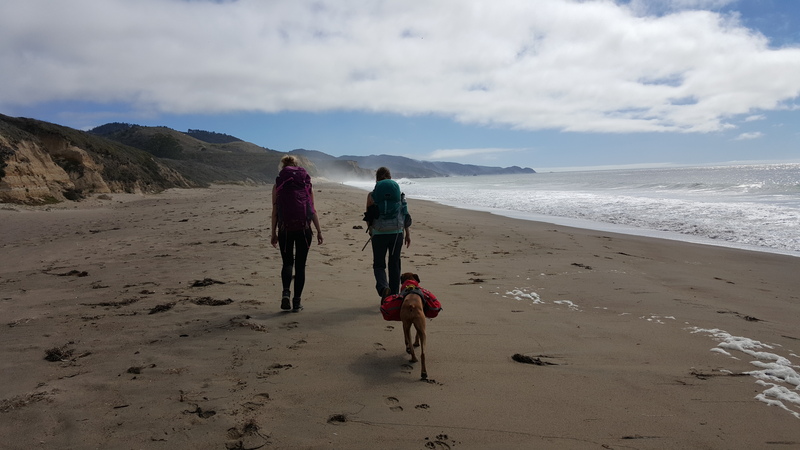 Backpacking, Alamere Falls, Point Reyes Lighthouse and the Cypress Tree Tunnel are just a few of the amazing sites at Point Reyes. This beautiful protected area is just a short hour and a half drive north of San Francisco. 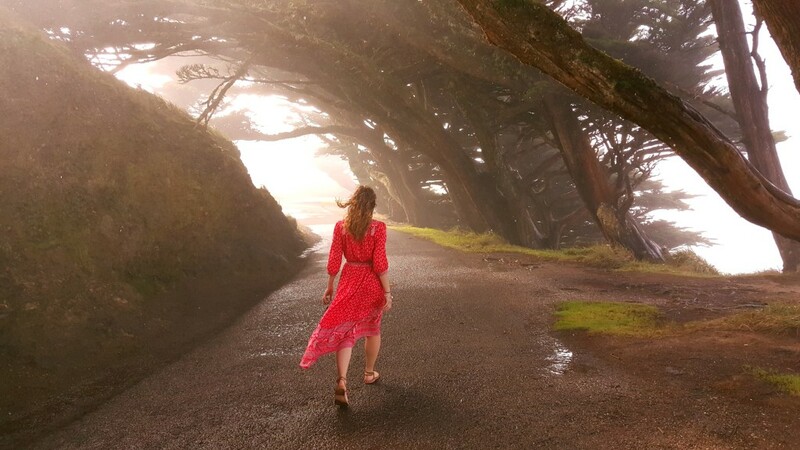 While most tourists go to Muir Woods, the Golden Gate Bridge, and ride along on their Segway at Fisherman’s Wharf, the locals head to places like Point Reyes. As one of my favorite spots on the California coastline, there are several activities to enjoy this as a day trip or an overnight hike. The fall is the best time to visit northern California. The best time to hike is in September and October after the foggy summer in the Bay Area comes to an end. Point Reyes is one and a half hours north of San Francisco. Take highway 101 north to the town of Gallinas. Follow Lucas Valley Road until the end, and turn right on Nicasio Valley Road. Turn Left on Point Reyes-Petaluma Road and drive through the town of Point Reyes Station. 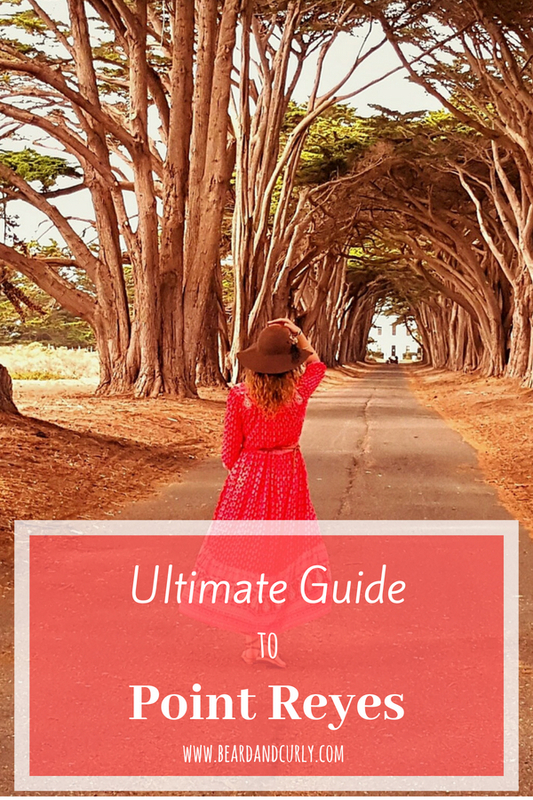 This is your best place to stop for anything you need to bring into Point Reyes. There are a few shops including the Cowgirl Creamery for a packed lunch. From town, take Sir Francis Drake Blvd north into Point Reyes National Seashore. There are several routes to Alamere Falls, with the easiest and most scenic the coastal hike via Wildcat Campground. If booking permits ahead, this can become an awesome two-day trip by with an overnight stay at Wildcat Campground. This coastal hike has exceptional views and is a moderate hike, but can be challenging for some because it is a long hike. We suggest starting from the Palomarin Trailhead if ONLY hiking to Alamere Falls, a 13-mile return hike. If you have two cars, we recommend starting from Liamantour Beach ending at Palomarin Trailhead, a 14-mile hike. From the Palomarin Trailhead, the first mile straddles the coast on the top of a cliff. The trail then heads inland down to the valley floor passing several lakes. The trail continues through forest and up to a bluff overlooking the coastline before descending down to Wildcat Campground. 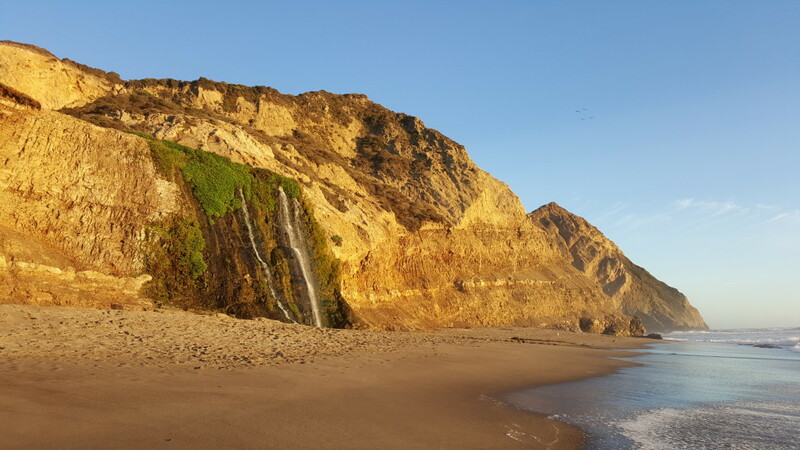 From Wildcat Campground, hike south along the beach at low tide for 1 mile to witness Alamere Falls as it plunges onto the beach. There are some dicey unmarked trails that can cut through near Alamere Falls, but there are no signs and dangers of erosion. Camping at Wildcat Campground is an excellent option for those wanted to stay the night and break up the hike into two days. There is a vault toilet and water faucet at the campground. Make sure to filter/treat the water. Also, beware of raccoons at night, so make sure to never leave any food outside. Permits: Permits are required to camp at Wildcat Campground. Make a reservation here. 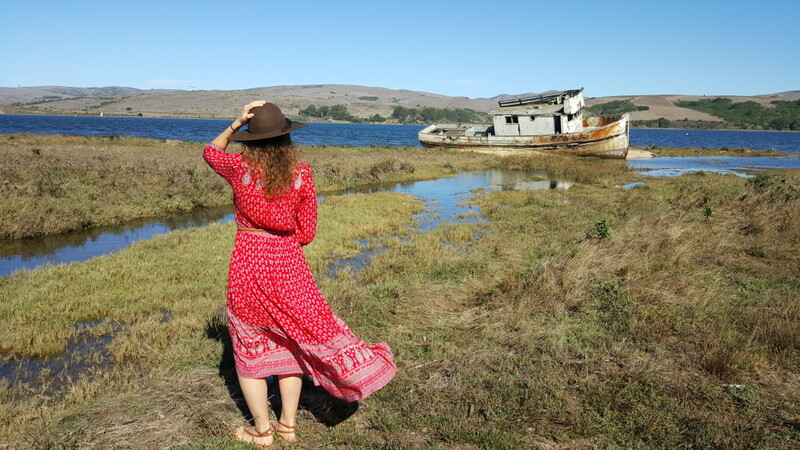 Located on a sandbar in Tomales Bay, there is a popular stop at a shipwreck. 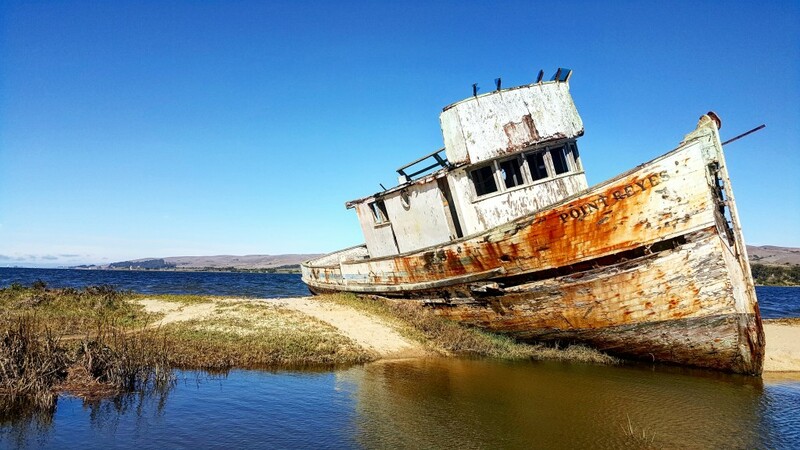 Known as the Tomales Bay shipwreck, the Inverness shipwreck, or the S.S. Point Reyes Shipwreck, this is a well-known place for photographers. There is a little market called the Inverness Store on the right-hand side of Sir Francis Drake Blvd, park in their parking lot. There is a small trail to the boat behind the shop. UPDATE: In February 2016, the boat caught fire from fireworks set off illegally by a reckless photographer. This iconic landmark is now charred and the rear of the boat was destroyed. While it is not fully intact, it still worth the visit. The Cypress Tree Tunnel is a stop you do not want to miss. 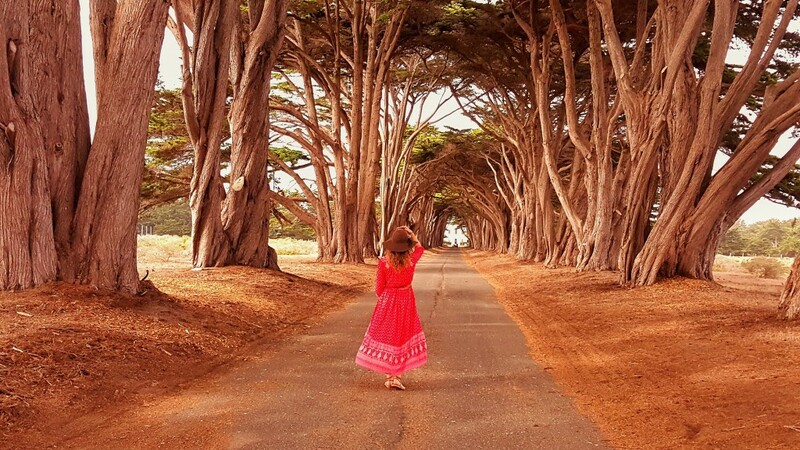 Directly off Sir Francis Drake Blvd, a tunnel formed by cypress trees is an iconic landmark for photographers. These trees were planted in the 1930’s along a road leading to the historic KPH Maritime Radio Receiving Station. This is one of the few remaining Morse communication stations in the world. This is a really interesting small office to check out as well. Point Reyes headlands jut out to sea for 10 miles, thus a lighthouse was built in the early 1800’s to help maritime travel from San Francisco north. 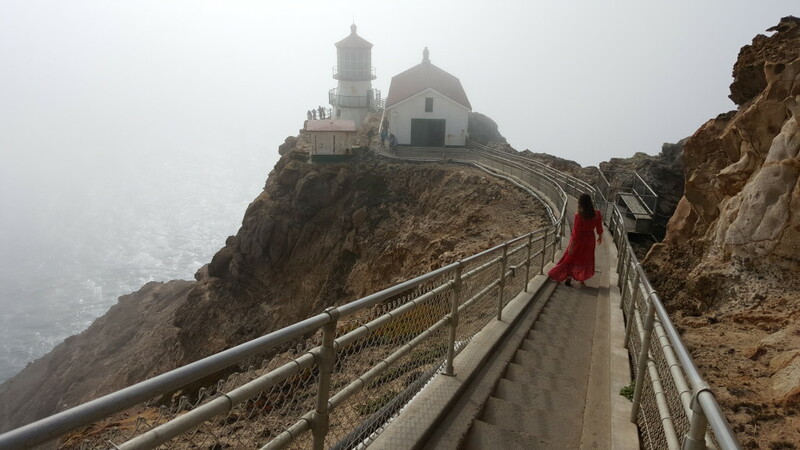 The lighthouse and lighthouse visitor center are one of the main attractions in Point Reyes. From the parking area, it is a 0.5-mile walk to the visitor center. From here, 308 stairs descend to the lighthouse. The area is known for dense fog as well as high winds. If winds are greater than 40 mph, the stairs leading to the lighthouse are closed. On a clear day, which is rare, this is an excellent whale watching site. Point Reyes Lighthouse visitor center AND the stairs leading to the lighthouse are only open on Fridays through Mondays from 10 am to 4:30 pm. Please note, a lighthouse restoration project is beginning in the summer of 2018 which will lead to closures.